... oh boy, have we got butteflies! 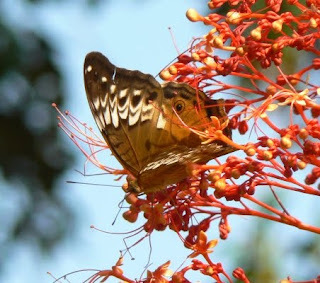 Today dawned with clear blue skies and the weather radar shows all the rain has moved away to the south - and now Daintree Valley Haven is literally awash with butterflies. A few minutes ago I snapped this brown male Cruiser - wingspan approx 4 inches - although couldn't get a good shot with his wings open. 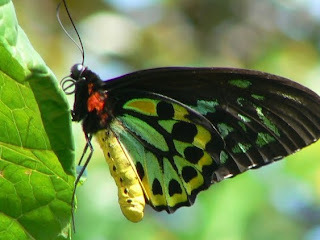 Then nearby a beautiful male Cairns Birdwing posed nicely for me - his wingspan was even larger. Now to start getting all the rampant vegetation under control again as everything grows so fast here that it's never a case of 'planting more' - it's always 'cutting back' what's already trying to take over! A lovely week of beautiful tropical rain with some heavy falls - here in the Daintree Valley we've had almost 13 inches in the past week and at one stage nearby Port Douglas recorded 8 inches in 48 hours. 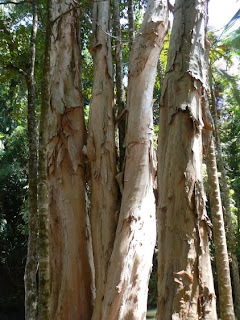 All quite normal and what we expect here in the Wet Tropics at this wettest time of the year - it's such a magical season and we love the sight, sound and smell of tropical rain, plus it's lovely and cool while it rains. It gets steamy when the sun comes out again but then we do have an indoor pool and an air-conditioned bedroom and office! Then today has been a beautiful sunny day - and we could see how much the grass has grown! Peter had to 'borrow' my old ride-on mower, which I use to pull the little trailer of cleaning gear and laundry for the cabins, because 'his' big mower is in pieces in the shed awaiting spare parts! Too good an opportunity to miss to do some much-needed grass-cutting - more rain is forecast tomorrow. Not good weather for wildlife-photography, although the butterflies are going berserk after the rain but so hard to photograph - dozens of Ulysses, Birdwings, Swallowtails and many unidentified species fluttering around the Pagoda Plants outside the kitchen today. It's great to have our good friends Peter and Elaine staying with us for a week - over from Wales on holiday. So on Tuesday we again headed up the Bloomfield Track to Cooktown (see blog on 28 Nov 2009) - Barry and Di came too so a fun couple of days was had by all. We've been incredibly lucky with the weather, especially as it IS officially the Wet season with just the odd heavy downpour but mostly clear blue skies and sun. 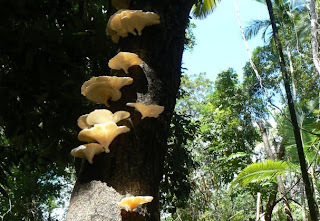 Stopped at some beautiful rainforest creeks in Daintree National Park on the way up and couldn't resist snapping these amazing fungii and a lovely group of Paperbark Gum trees at one secluded little spot. Back in action - almost! This has been a red-letter week for us! 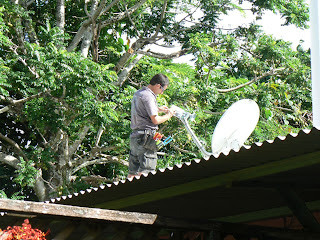 After weeks of frustrations at 9 am on Monday John arrived to fix the satellite modem - part of it was full of water after recent heavy rain! - and on Tuesday two Telstra techs turned up and fixed our phone (ants had chewed through a cable!). On the same day we had a message to say our replacement Windows 7 software had arrived at Officeworks in Cairns so we'll soon be able to start using our brand new desktop - as luck would have it we have to go to Cairns on Saturday (2-hour drive each way) to pick up our friends from the airport. 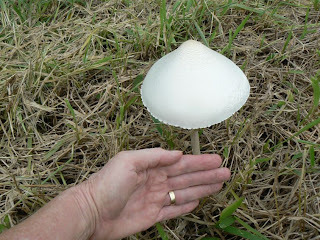 On my walk the other day, again after some heavy rain, I spotted this enormous toadstool in the middle of some open grassland. Pity it wasn't a mushroom!